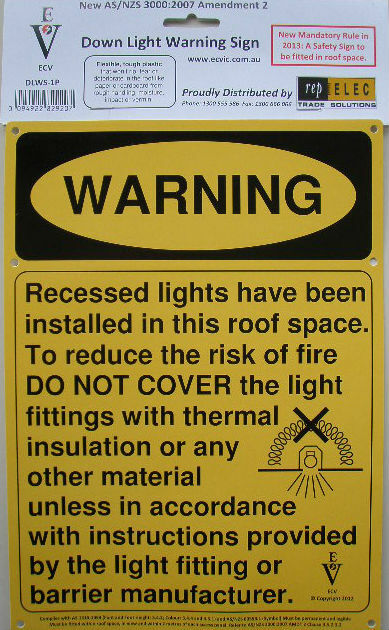 Where recessed luminaires are installed in an accessible roof space, a permanent and legible warning sign shall be installed in the roof space adjacent to the access panel, in such a position that it is visible to a person entering the roof space. The sign shall comply with AS 1319 and contain the words shown in figure 4.8 with a minimum size of lettering of 10 mm. The warning sign from “rep ELEC Trade Solutions” appears to be well designed and compliant with AS 1319:194 (Font and Font Height: 3.4.2; Colour: 3.4.4 and 3.5.1) and AS/NZS 60598.1 (Symbol) Must be permanent and legible. 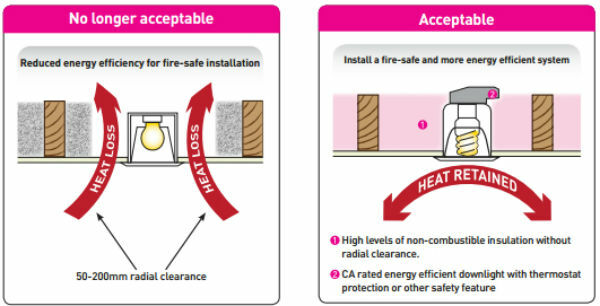 The Warning Sign Must be fitted within roof space, in view and within 2 metres of each access panel. Refer to AS/NZS 3000:2007 AMDT 2 Clause 4.5.2.3.2. There are several warning signs available from the electrical wholesalers. However, this Warning Sign from “rep ELEC Trade Solutions” appears to be very well designed and manufactured. They have added the AS/NZS 60598.1 symbol meaning “Do Not Cover Down Lights”. This provides immediate visual impact and clarity to the Warning Sign. Secure the Warning Sign in the roof space in view and within 2 metres of each access panel. This sign is designed using flexible yet durable plastic that will not cause personal injury to any person in the roof. It will not break, tear or deteriorate from rough handling, moisture, impact or vermin. Indicates a statement is mandatory. I have included this information as the definition of “Shall” was only recently added to the Electrical Wiring Rules. This entry was posted in News and tagged AS/NZS 3000:2007 Amendment 2, electrical wiring rules, LED Down-lights, Mandatory, shall, warning sign on November 15, 2013 by admin. This is a true replacement for the old 75Watt incandescent Light-bulb. It has a warm white output of 1055 Lumens. This output is slightly whiter than the average light-bulb and appears to provide a greater light output. 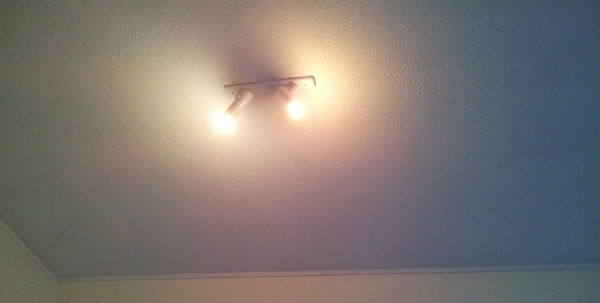 The 13Watt LEDbulb is in on the left in this picture. 75Watt incandescent Light-bulb on the right. The 13 Watt LEDbulb has an life expectancy of 15,000 hours. That would equate to about 10 years if the LEDbulb was on for 4 hours every day. The 13 Watt LEDbulb can be installed in down-lights. The down-lights must be at least 75mm in diameter and be of the open type. LEDbulbs produce far less heat than incandescent light-bulbs. However, it is important to maintain an air space around the LEDbulb to allow the electronic circuitry in the LEDbulb to maintain a normal operating temperature. This is a non-dimmable high output LEDbulb ideal for general lighting throughout the house or office. 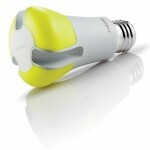 Philips also have a range of dimmable LED Lamps. This entry was posted in News and tagged 13W LEDbulb, LEDbulb, Philips LEDbulb on July 4, 2013 by admin. This entry was posted in News and tagged CA-80, CA135, down-lights, IC, IC-F, installation, Non-IC on June 30, 2013 by admin. Philips said it will begin shipping a 100W-equivalent lamp in its EnduraLED line in the Q4 of this year. The new lamp looks virtually identical to the 60W and 75W EnduraLED retrofit lamps that are broadly available. The family uses remote phosphor technology and the lamps have an orange/yellow tint when not powered on, whereas the GE lamps look white. Both the Philips and GE products have cooling elements that extend up onto or into the globe making them easily distinguishable from incandescent bulbs. The new Philips lamp uses only 23W and produces almost 1700 lm according to Philips. The 2700K lamps will have a CRI of 80 and will be dimmable. Philips has not priced the lamp as yet, but said that the lamps will save buyers $211 over a lifetime of 25,000 hours. Philips also offers PAR and BR type lamps in its EnduraLED product line, and at Lightfair will introduce new models that include a technology called Airflux that eliminates the heat sinks that are typically prominent in LED-based PAR and BR retrofit lamps. Philips hasn’t revealed the details of Airflux yet, but we expect to learn more about it at Lightfair later in the week. The new lamps include a choice of three color temperatures and beam angles. Philips said the lamps save 75% in energy relative to PAR halogen lamps or BR incandescent lamps. The PAR retrofits are directional whereas the BR lamps provide diffused light with a new optical design. “Airflux lamps blend into existing white track and recessed fixtures, and offer equal light quality to that of traditional light sources – attributes that lend themselves to a more pleasing environment in retail stores, hotels and restaurants,” said Ed Crawford, general manager of lamps, lighting electronics and controls for Philips. Moving back to the A-lamp space, expect more news in the 100W-equivalent area later this week. Osram Sylvania showed a prototype of a 100W-equivalent lamp at Lightfair last year. Switch Lighting launched their 100W equivalent two months ago. And Lighting Science Group is also a potential player at the 100W level. Lightfair will see a number of companies introduce SSL retrofit lamps that are equivalent of 100W incandescent bulbs and GE Lighting and Philips Lighting announced such products before the exhibits opened. Information from the “LED’s Magazine 8 May 2012”. This entry was posted in News and tagged 100w, 75e EnduraLED, Airflux, CRI, design, diffused, dimmable, directional, Lightfair, optical, PAR, Philips, phosphor technology, retrofit lamps, SSL on June 30, 2013 by admin. We have learned more about the internal design of the L Prize winner from Philips. 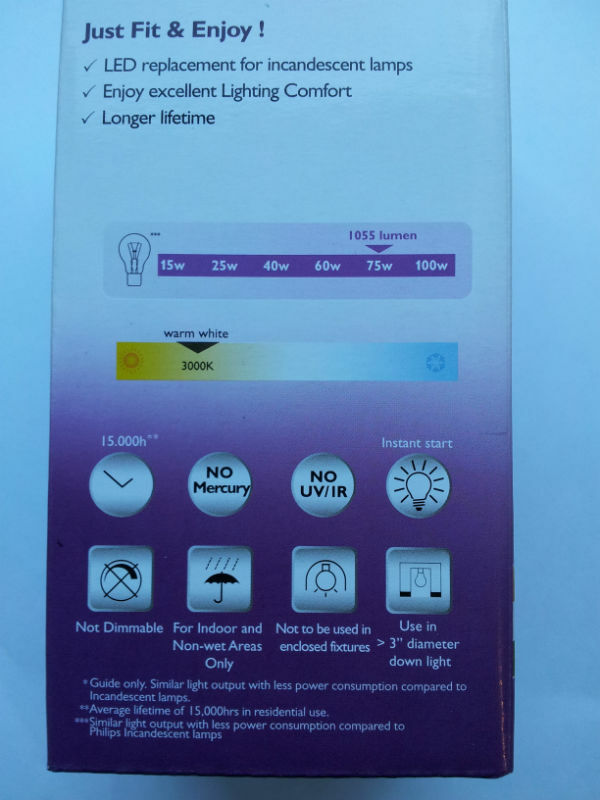 If you see a photo of the product, you will notice that the remote phosphor is more yellow in color relative to the almost-orange tint of the 65W – and 75W – equivalent lamps that Philips has been selling under the EnduroLED and AmbientLED brands. The L Prize winner actually mixes red and royal blue LEDs in each of the three illumination chambers. The yellow phosphor converts the blue light to white, while largely passing the red light through. Philips’ Lindstrom said the technique was required to achieve the greater than 90 CRI required for the L Prize. The red light yeilds a warmer color temperature and broadens the spectral power distribution for better color rendering. Mixing LED colors is a technique that has been used broadly by LED makers Cree in its TrueWhite technology and Osram Opto Semiconductor in its Brilliant-Mix technology. But apparently the L Prize winner marks the first time the technique has been used in a standard retrofit lamp. This entry was posted in News and tagged AmbientLED, Cree, CRI, EnduraLED, L Prize, LEDs, Opto, Osram, Philips, TrueWhite on June 30, 2013 by admin. The Totalsupport gallery contains a selection of Efficient and Effective LED lighting applications and some more traditional halogen lighting examples. 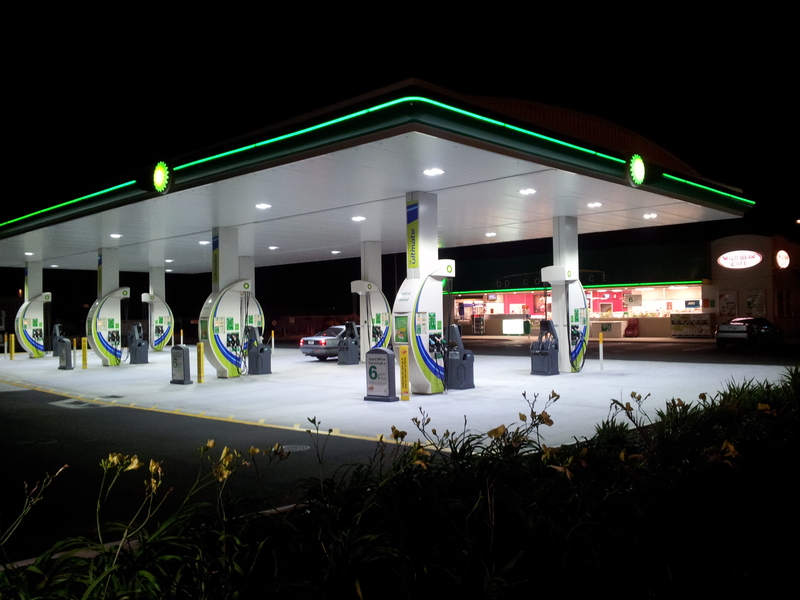 Efficient and Effective use of LED lighting to illuminate the BP petrol station. LED lights are ideal for petrol stations as they provide safe and efficient lighting. The power consumption of the LED lights is far lower than any other form of lighting suitable for petrol stations.Pictures in the Gallery. Maintenance costs are minimal as the LED lights last for many years. The long lasting LED lights eliminate the inconvenience and safety issues resulting from the replacement of the lamps or tubes in the older style lighting. The following older style light fittings require regular lamp or tube replacement – halogen, metal-halide, mercury-vapor, sodium-vapor or fluorescent lamps. The LED lights provide a very clean white light that enhances the appearance and safety of the petrol station. This entry was posted in News and tagged fluorescent lamps, halogen, Maintenance costs, mercury vapor, metal-halide, Power consumption, safety, sodium vapor, Totalsupport, tubes on June 30, 2013 by admin. This entry was posted in News and tagged LED Control, wifi on June 30, 2013 by admin. Published a List of Electrical Products and Services provided by Total Support. This Products and Services include Complete Electrical Installation, LED Lighting and Optimizing – Energy Efficiency. The installation of IP65 HALERS EvoLED down-lights to replace halogen down-lights significantly improves the Energy Efficiency of a home by preventing heat from escaping through the down-lights. This entry was posted in News and tagged down-lights, Electrical, Energy Efficiency, LED Lighting on June 30, 2013 by admin. IMPORTANT The Ministry of Economic Development – Downlights and their Installation Requirements From 10 May 2012 Mandatory change to the AS/NZS 3000 Electrical installations. 10 May 2012 marks an important date for installers of downlights in New Zealand. Amendment A to AS/NZS 3000 Electrical installations ‘the wiring rules’ becomes a regulated mandatory part of that standard on 10 May 2012 through an amendment to the Electricity (Safety) Regulations 2010. Regulation 118A is interpreted to apply consistently with the rest of the regulations. That is, it applies to installation work that commences on or after 10 May 2011. The installation of downlight fittings in ‘residential installations’ that commences on or after 10 May 2012 will have to use one of the following types of fitting: CA 80, CA 135, IC, or IC-F.
Downlights and associated fittings, or recessed luminaires to use the technical terminology, generate significant amounts of heat. As a consequence the installation of downlight fittings requires particular care. In order to address the hazards that arise from the increased use of thermal insulation, Standards New Zealand published Amendment A to AS/NZS 60598.2.2 Luminaires Part 2.2 Particular requirements – recessed luminaires in July 2011. This New Zealand-only amendment introduced four new categories of downlight fitting that allow for thermal insulation to either abut the fittings (CA 80 and CA 135), or abut and cover the fittings (IC and IC-F). For the purposes of these requirements, ‘residential installations’ are considered to be electrical installations in homeowner or rental domestic dwellings, flats and the like. The intention is to address risk in situations where it is likely that during the life of the electrical installation, thermal insulation will be installed in ceilings by homeowners or other persons who are not familiar with the risks of covering downlights. Manufacturers of downlight fittings are required by AS/NZS 60598.2.2 Amendment A to specify in their instructions the types and/or characteristics of insulation that are safe for use with those fittings. Downlight installers have to choose fittings compatible with the insulation that is or will be present or, alternatively, the insulation must be selected by the homeowner to comply with the manufacturer’s instructions for the fittings. The ability to repair or do ‘like for like’ replacement of a downlight fitting that was already in place on 10 November 2011, when the regulations were amended, is not affected by this requirement provided it does not result in an unsafe installation. The requirement to only install the new categories of downlight fittings does not apply to premises, including hostels, motels, hotels or hospitals, where insulation is likely to be put in by professional installers who are aware of the risks associated with laying thermal insulation over or close to light fittings and electrical wiring. It will continue to be permissible to supply downlight fittings that are not in one of the new categories (ie not CA 80, CA 135, IC, or IC-F) into the New Zealand market for use in installations that are not ‘residential’. Up until the 28 July 2012 downlight fittings that meet AS/NZS 60598.2.2, with or without Amendment A, are deemed acceptable by Schedule 4 of the Electricity (Safety) Regulations 2010. Alternatively, compliance may be established by application of AS/NZS 3820 Essential safety requirements for electrical equipment. From 28 July 2012, only those downlight fittings that meet AS/NZS 60598.2.2 Amendment A are deemed acceptable by Schedule 4. Note, however, that application of AS/NZS 3820 remains an acceptable alternative. Compliance with AS/NZS 60598.2.2 without Amendment A will no longer be sufficient to demonstrate safety. Supplier declarations of compliance for downlight fittings imported or manufactured in New Zealand after 28 July 2012 that do not meet AS/NZS 60598.2.2 Amendment A will have to be made with reference to AS/NZS 3820 and the relevant compliance mechanism identified in that standard. To comply with clause 2.3.1 of AS/NZS 60598.2.2 Amendment A, a ‘closed recessed luminaire’ does not necessarily have to be constructed so as to appear to be fully enclosed. The provision in clause 2.3.1 relates to the free air path that communicates directly between the occupied space that is illuminated and the space into which the downlight fitting is recessed. This entry was posted in News and tagged AS/NZS 3000, CA 135, CA-80, down-lights, Electrical (Safety) Regulations 2010, IC, IC-F, LED Lighting, Mandatory, Ministry of Economic Development, safety on June 28, 2013 by admin.